A system with an ATI Radeon HD 4800 & 4600 Series graphics card can help enhance the HD entertainment experience by providing a seamless connection to an HDTV or home theater system. With built-in 7.1 surround sound audio (AC3 / DTS ), the new GPUs and graphics cards support single cable connection directly to a compatible HDTV, projector or receiver. This single cable carries both the HD video and 8 channel audio for a clean, high definition connection. Some graphics cards will be equipped with an HDMI connector, while others will output the HDMI signal using a special ATI Radeon DVI-I to HDMI adapter. These options give consumers more options and flexibility when connecting their PCs to monitors or home theaters for maximum enjoyment of HD content. The new GPU also supports xvYCC color which can display a wider range of color when connected to capable HDTVs. In addition to HD video, today's high-def disc formats can also support more detailed audio. Most Blu-ray Disc™ players support 7.1 audio formats, and some even offer high-quality, lossless surround sound. While your high-def disc player and receiver may be able to decode these new surround sound formats, it's important to note that not all discs you play will take advantage of them. Be sure to check out the details on the high-def discs you watch to see which audio format they use. You'll also want to connect your player to a compatible receiver using your disc player's 7.1-analog audio outputs or a compatible HDMI output (version 1.3). The newest high-resolution surround formats, Dolby TrueHD and DTS-HD™ Master Audio, offer up to 7.1 discrete channels of lossless audio. Along with adding two extra rear channels to the standard Dolby Digital and DTS formats, Dolby TrueHD and DTS-HD Master Audio discs are encoded with more audio information per channel. In fact, it's identical to the movie studio's original master. That means the improved directionality and more precise effects makes it even closer to the experience of being in a movie theater. You may find that some Blu-ray discs are also encoded with other discrete 7.1-channel surround formats. Dolby Laboratories and DTS developed Dolby Digital Plus and DTS-HD (High Resolution), respectively. 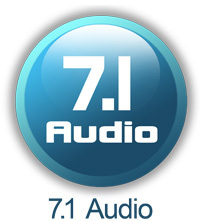 These formats deliver 7.1 independent channels of sound. They provide more detailed surround effects than 5.1 Dolby Digital and DTS, though they aren't lossless like Dolby TrueHD and DTS-HD Master Audio. Receivers that support lossless 7.1-channel formats will also support Dolby Digital Plus and DTS-HD (High Resolution).